Available in printed, e-book, and PDF format. 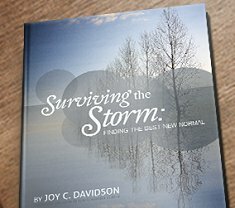 Joy’s book, Surviving the Storm details her journey through an eight month flood of change describing how her faith guided her to a new season of life. She is passionate about helping those who are transitioning find the Best New Normal and utilize their faith to accept and embrace change. A Colorado native, Joy C. Davidson has had many roles in her life: mother, financial services advisor, driving coach, and lifeguard to name a few. After raising her family, she found a new calling in caregiving. She most recently helped her mother navigate her journey with Vascular Dementia. 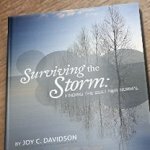 This life-changing season propelled Joy into writing and speaking about utilizing life’s storms for growth with a positive attitude.